Estimate roof installation prices for: asphalt or metal shingles, standing seam, TPO, EPDM Rubber, PVC, and Tar & Gravel. Simply input your roof slope and basic measurements, choose the material and get your results. The quote includes all materials, accessories and labor by a licensed and insured contractor. You can also specify your location to get a more accurate "local" cost. 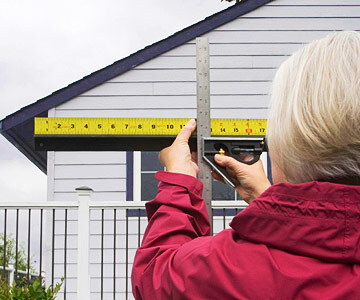 1) Measure your roof - with a tape measure, go corner to corner and measure ground dimensions of your home. If it has overhangs, add them to your sizes. For example: If overhangs are 6", add 1 foot to each side. If overhangs are 2 feet on front an back, and there are no overhangs on the sides, add 4 feet to the appropriate side. 2) Enter the slope - you can guesstimate or measure it. Home Depot sells a visual "pitch measuring tool", or you can use a simple square tool, line it up with your roof's gable and measure RISE over RUN - see image on the right. 3) Select type - if you have a simple gable (ranch / cape / colonial type homes), select that. If you have hips, dormers, select "hip". If it is all cut up, and has different slopes and angles, select the appropriate option. 4)Tear-off - it is always a good practice to remove old shingles. This will allow the contractor to repair any damaged wood below, and will prolong the life of the new material. Select the number of layers that need to be removed. 5) Select number of floors - it is much easier to work on a 1 story house vs. a triple decker. This will always be reflected in the total you are about to pay. 6) Chimneys, skylights and ridge ventilation - enter the number of penetrations and the length of your ridge line (if you are getting a ridge / soffit vent system). Most homes have at least one chimney, so you should add that. 7) Enter material - the quality and longevity will be reflected in the total cost. 30 year asphalt shingles are the cheapest, while metal is much more durable and therefore more expensive. Among single-ply options, PVC membrane is the best and most costly choice, while EPDM rubber is the cheapest and least durable. 8) Select your location - roofing cost can vary greatly depending on where you live. By selecting your region, the tool will adjust the price accordingly (data is based on Remodeling Magazine's local prices guide). If you are unsure, or live in Canada, select National Average. Keep in mind that there are many factors that will affect how much you will end up spending. However, this calculator will give you a very good idea of what a real roofing estimate should be. This information will help you understand whether a pro is offering a fair deal, or trying to overcharge you. Most contractors in US and Canada have a similar formula as the one we use here. Typically, it is based on SQUARES (100 sq. ft. of area). Unless you have a super cut-up house, 95% of contractors will price it by the square. This makes it very easy to compare quotes, and choose the best deal. MONEY-SAVING ADVICE: don't try to be all cheap, such as buying materials yourself, or doing the demolition work (tear-off). It will piss off your contractor, create a whole bunch of logistical problems, and in the end, you will be paying more, if you do this. The industry has become so competitive that pros rarely mark-up materials. 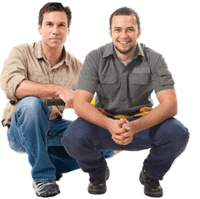 In the end, even if you save a couple of bucks, it will be too much of a hassle, your "aggravated" contractor will most likely be cutting corners, and ultimately you will be getting a much lower quality install. On average, homeowners across the US report that a 1,500 sq.ft. gable style roof outfitted with architectural shingles costs $4,790 - $6,655. This includes all materials, including insulation, tear off and professional labor. Premium roofing materials, such as metal are significantly more expensive. Installing metal shingles on a 1,500 sq.ft. roof will run about $10,500-13,600. Here is a summary of the most popular materials and their cost per square foot. In addition to the new roofing material, you may also need to replace other important parts of the roof, such as fascia boards, gutters, and vents (soffits). Depending on the size of your roof and the material you want to use, new gutters can cost $10-12 per linear foot. Wood fascia costs $1-3 per linear foot, while aluminum fascia costs $8-9 per linear foot. Not sure which roofing material to choose? In addition to cost and overall curb appeal, its important to consider the durability and longevity of various roofing materials. Moreover, you need to consider them based on your local climate. If you live in an area that gets a lot of rains, cedar shingles will not be a wise choice, while they will be just fine a dry mild climate. Composite shingles don't do so well in regions that have severe temperature fluctuations and ice dams. Metal roofs can be installed pretty much in any climate as they are resistant to strong winds, fire, ice and snow, as well as rain storms. Consult with your roofing contractor about which types of materials last the longest and provide leak-free service in your area. Even if this material costs more than your typical shingles, it may be a worthwhile investment especially if you plan to live in your home for the foreseeable future. Many homeowners wonder when is just the right time to replace an old roof. Because its such a big and expensive project, some people tend to put it off for too long and then rush into getting a new roof when it becomes a real emergency or safety hazard. Ideally, you should schedule this project at a time that is convenient for you, do thorough research, vet contractors and give yourself plenty of time to find the best deal. - if you have standard asphalt shingles and they are 20-25 years old, they are basically near the end of their service life, and you can start looking into replacement options. If you have a flat roof, this time frame can be as short as 10-15 years. - when your roof continues to be the source of major leaks, despite numerous repairs. This is often true with flat roofs made of EPDM rubber, but can also happen with budget quality composite shingles. - if you are selling your house and it requires major exterior to improve curb appeal. A roof is one of the most visible parts of the house, and a good looking roof can be a major point of attraction. If you are after curb appeal, there is no need to invest thousands of dollars into a very expensive, high-end material. Middle of the road, architectural shingles, such as GAF Timberline, should get the job done. While replacing an old roof is one of the least glamorous updates you can do for your home, it offers a great return on investment. If you are selling your house, or plan to put it on the market in the next 2-3 years, a brand new roof will make it a lot more desirable to buyers. Nobody wants to deal with leaks and related problems. So if your home is beautiful inside, but has a problematic roof, many people will either walk away, or ask you to replace it, before closing the deal. This is particularly important in regions that get a lot of inclement weather, such as snow, ice dams, heavy rains, hurricanes, etc. In these areas, you will see the highest return on investment when doing a re-roof. For example, in the Northeast, homeowners can recoup as much as 96% of the roofing cost. Across the US, you can expect to get about 80% return. In the Midwestern states, the ROI is lower, about 70% Still, this is 20-25% higher than most other popular remodeling projects. Homeowners that install metal roofing can be sure that they will get a high return. While this roof can cost 50% more than composite shingles, being a truly lifetime material that protects your home in any weather, allows metal to maintain its value over time. A metal roof that has been installed 20 years ago will be just as desirable as a 10 year old roof. The same is NOT TRUE for asphalt or wood shingles. Other premium materials, such as clay tile or slate certainly hold their value, but because they are so costly to begin with, you will not be able to recoup more than 40% of your initial investment at resale. What’s the difference between your calculator and this calculator at: roofcalc.org? More options – chimney and skylight flashing, ridge ventilation cut-in and install. does your calculation include labor costs? Thanks for asking. Yes it does include cost of labor. If you were to calculate materials only, they are usually 1/3 of the total job cost… sometimes a little more, depending on what shingles or other material you are using.